Zoro was the first crew member to be recruited by Luffy. Zoro is a skilled swordsman who fights with his own unique sword style known as santoryu (three katana fighting style).This is achieved by using one katana in each hand and another in his mouth. He is also seen fighting with only one or two swords. When in a serious fight he ties his normally, tied on the arm bandana, on his head. Though not a samurai, he appears to maintain a certain degree of bushido, and is frequently mistaken for one. Unlike Luffy and most of the other Straw Hat pirates, Zoro has been known to kill his opponents if he has to, though never in cold blood. 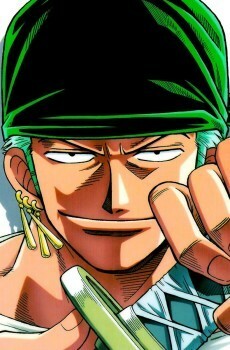 Zoro has a stern, serious and distanced personality, but unlike Robin he often reacts in a goofy and exaggerated comic style due to his gruff, impatient attitude. On the ship, he normally either trains with weights or sleeps. The only work he is seen doing regularly is hoisting the anchor using his great strength. He also likes sake, almost to the degree that Luffy likes meat, but like Nami, he never gets drunk due to his inhumanly-high endurance and tolerance for alcohol. Another notable trait is his lack of orientation, as Zoro often gets lost, even in small, familiar spaces or when being led by someone. Despite this, he is often the first to sense an enemy or danger, and the first to react. He is often displayed being well aware of dangerous situations and people around him. Zoro often also reminds others of the harsh facts, which often shocks some of the other crew members, although they usually decide he is right. Zoro has also stated that he is an atheist, and has never believed in anything except himself. He often comes across as arrogant and overconfident, but only because he knows he's a strong man with great fighting ability. Even so, Zoro knows that he still has a lot of untapped potential, and is constantly seen training and trying to improve his fighting skills. He also adheres to a strict sword master's code of honor, and never falsely brags or lies about his abilities, sometimes outright admitting a weakness, even to an enemy. He also never tries to escape from a fight or use trickery to win, believing that doing so is cowardly and scorning anyone who uses such tactics. Zoro is very vigorous, strong-willed, and determined.